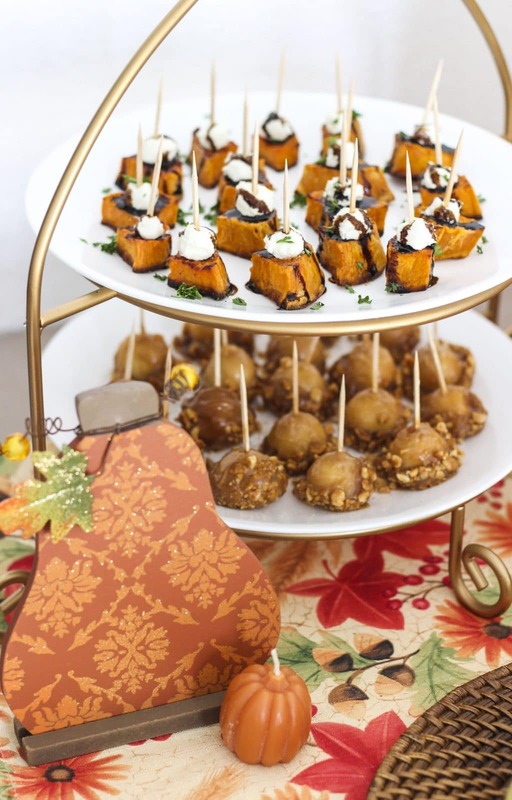 Get all my tips and tricks for hosting the best fall party for your friends and family! 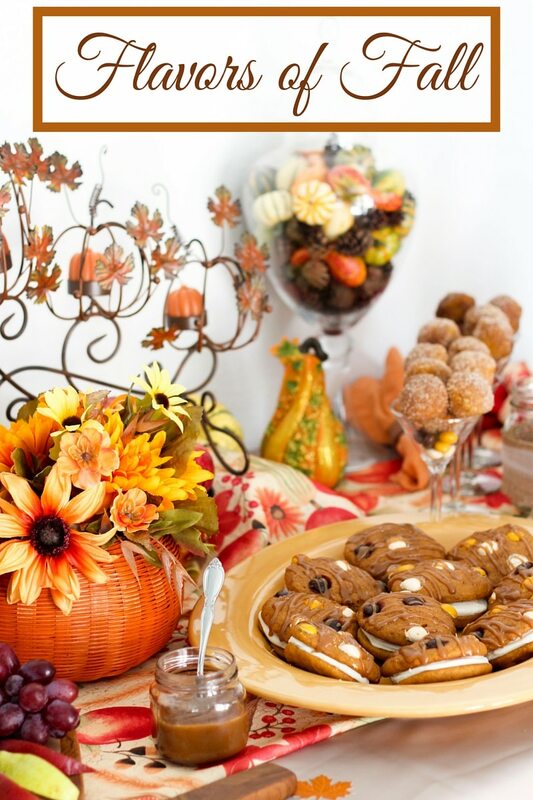 Get delicious recipes, easy craft tutorials, and budget-friendly holiday decor inspiration ideas to help you throw your own fall party! I love everything about fall. Cooler weather, boots, cozy sweaters, hot apple cider, pumpkin flavored treats, and the changing leaves. Unfortunately, here in Florida, we don’t have much of a fall season. Last year, I was lucky enough to experience a real fall, when my mom and I visited NYC in October. It was stunning, to say the least. Walking through Central Park is magical, I’ve never seen so many different colored leaves before. It’s something in the air that makes every minute feel extra special. I brought that magical feeling home with me so I can remember it and celebrate it each fall here at home. 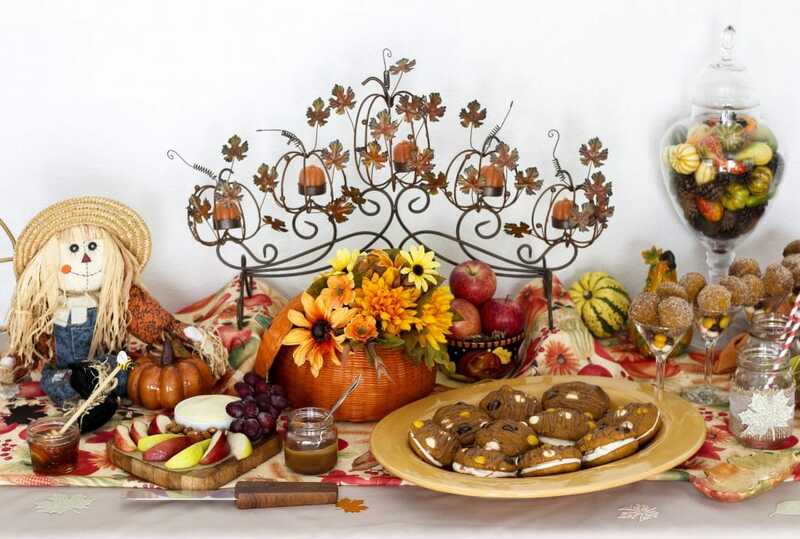 Planning a fall party is so much fun! I wanted it to feel very rustic, and incorporate the colors of the changing leaves; so lots of reds, oranges, yellows, browns, and dark green. I want it to feel like you’re outside, on a cool day, in an apple orchard or a pumpkin patch, with leaves swirling around you! 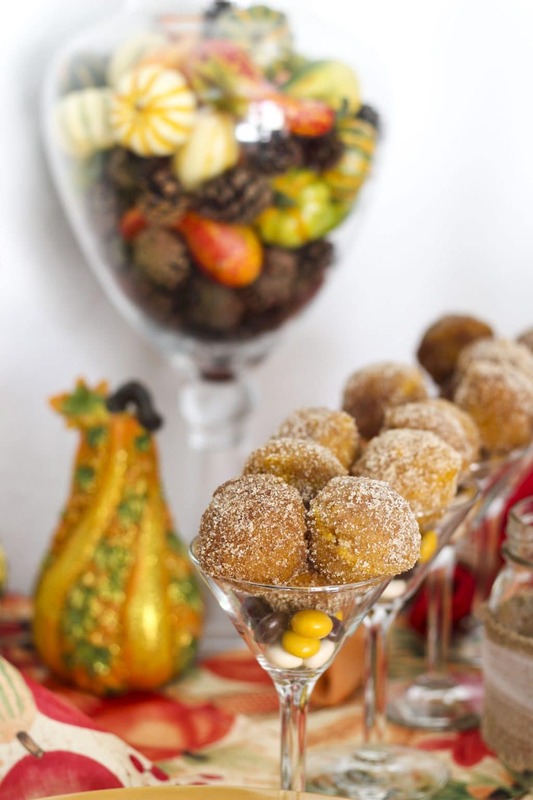 Before you start planning your party, think of the colors and textures you want to incorporate into the decorations. I like using a wide variety of colors, as you can see, I used different shades of orange, yellow, red, green and brown. They’re all fall colors, so they blend well together. Since I was using so many colors, I started with a neutral tablecloth. I added the patterned table runner as a pop of color, and to tie in all the colors of the decorations. I used a wicker plate, wooden platter, glassware, and a ceramic dish, all in shades that blend nicely together. The wicker and wood textured bases gave it a rustic feel. By using different textures, it creates interest when you look at the overall table. Each item looks special and unique. The same concept goes for height. Try to pick pieces that are varying heights. If everything was the same size, it would look boring, and our party is definitely not boring! I buy items that I can re-purpose and use for different holidays, not just one. 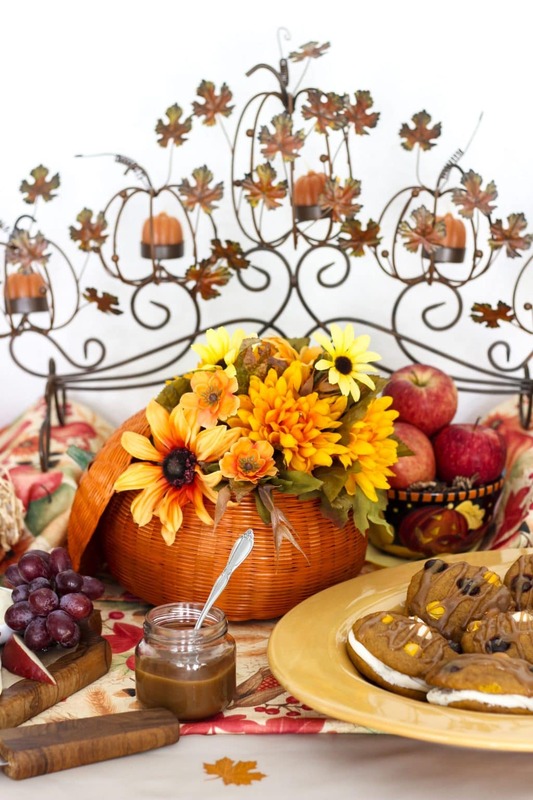 I stuffed the tall glass container with faux squash, pumpkins, and acorns to match the fall theme. I also use the same glass container for Christmas and Easter. At Christmas, I fill it with ornaments, and for Easter, I fill it with eggs. Buying decorations that you can use for different holidays will save you money and space! Tip – A great place to find beautiful decorations and props for your party, without breaking the bank, is garage sales and thrift stores. Just be picky and only buy what you really love. I’ve found some of my favorite pieces that way! I like to serve finger foods that are easy to pick up and eat. By serving the food in individual portions, it’s easy to grab and go. Also, remember your color scheme? Try to plan your recipes around those colors as well, so everything flows. The ginger pumpkin carrot soup is my absolute favorite fall-flavored soup! The pumpkin and carrot give such delicious flavors and go so darn well together. I make this soup for us all the time in the fall so I just knew I had to serve it at the party in small portions! As soon as you take a sip of it, the flavors of fall will wash right over you! Get the ginger pumpkin carrot soup recipe here! I think I may have eaten half of these sweet potato bites all on my own. They’re SO delicious! I love the smoky flavors and the caramelized bits are so addicting! It goes so well with the creamy goat cheese and tangy balsamic glaze. I can’t say enough about them, you just have to try them for yourself! Roasted sweet potato chunks stacked with goat cheese and a drizzle of balsamic vinegar. Lay sweet potato cubes onto a parchment lined tray. Drizzle olive oil and all of the seasonings over the potatoes. Mix with your hands to evenly coat every cube. Roast for 25-30 minutes, turning halfway through. Let the sweet potato bites cool slightly and then top each bite with a small dollop of goat cheese. Drizzle balsamic vinegar over the top of the platter right before you serve. The stars of the party are my Harvest Whoopie Pies, I had so much fun making these! One of our favorite sweet treats we had in NYC last year, was a delicious pumpkin spice whoopie pie with cream cheese filling. 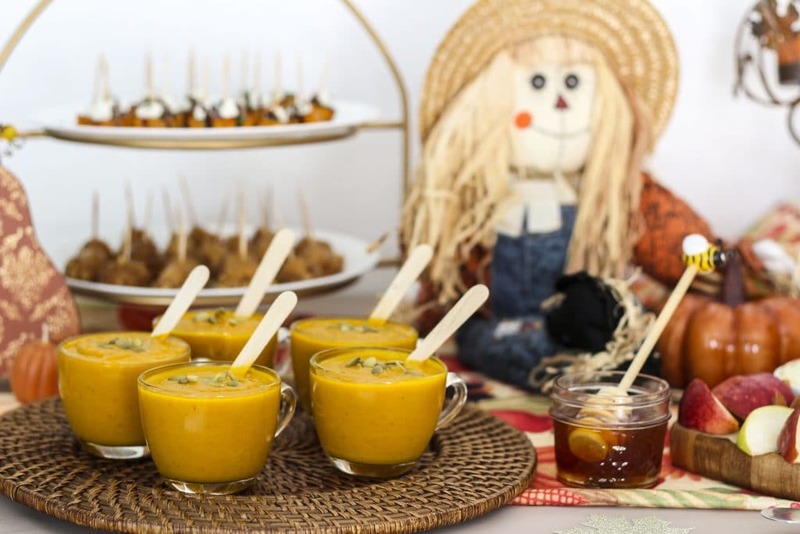 I wanted to recreate that sweet treat for my Fall party. Of course, I had to put my own spin on it, so I made Harvest Whoopie Pies with M&M’s® Pecan Pie, with a caramel drizzle. YUM! Start by preheating the oven to 350 degrees, mixing all the wet ingredients in one large bowl, and the dry ingredients in another bowl. Slowly pour the dry bowl into the wet, stir until combined. Don’t over mix the batter. Scoop it into a pastry bag or a gallon size ziplock bag and cut the tip off. Pipe into circles or swirls, on a lined tray, these are the bottom cookies. Bake for 10 minutes. For the second tray, repeat the piping instructions but add 4-5 M&M’s® Pecan Pie to each cookie, these are the top cookies. Let them cool on a wire rack for 30 minutes. Scoop the Pillsbury™ Creamy Supreme® icing into a ziplock bag, and cut the tip off. Slowly, pipe the icing along the outside of the bottom cookies, and work your way to the middle. Doesn’t the cookie in the picture look like a soft, pillowy cloud!? I just want to take a big bite! Find a cookie top that is similar in size and lightly press both together. Drizzle caramel over the top of each cookie. 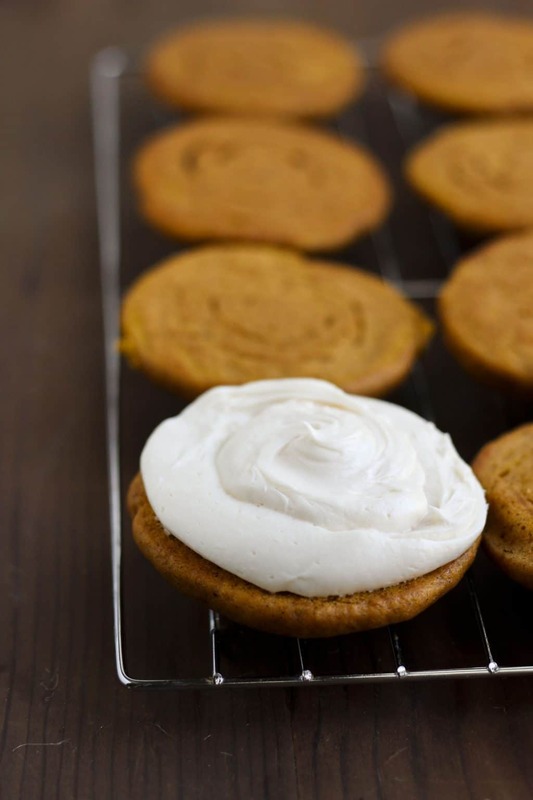 Pumpkin and apple flavored whoopie pies, filled with cream cheese icing and a drizzle of caramel sauce. Add pumpkin puree, brown sugar, white sugar, coconut oil, and vanilla to the mixing bowl. Beat together, add eggs. Mix until fully combined. In a separate bowl, add the flour, baking powder, baking soda, cinnamon, salt, and all spice. Stir to combine. Slowly add the dry mixture to the wet, while beating at low speed. Beat just until you can't see flour anymore. Be careful not to over mix. Scoop the mixture into a pastry bag or ziplock bag, cut the tip off. Pipe circles onto a lined tray. Bake for 10 minutes and cool the cookies on a wire rack. Repeat piping instructions for the second tray, add M&M's® Pecan Pie to each cookie top. Scoop Pillsbury™ Creamy Supreme® icing into a ziplock bag, cut the tip off and fill each cookie bottom. Find a top that is similar in size and shape, press lightly together. 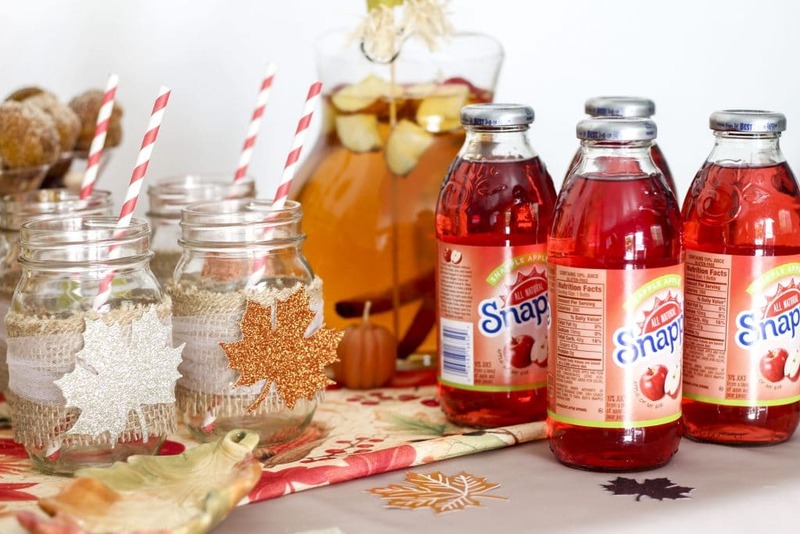 For drinks, I served Snapple® Apple bottles, and I made a pitcher of Apple Cider Fizz with Mott’s® Apple juice and fresh cinnamon sticks. If you wanted to make the Apple Cider Fizz into an adult beverage, you could add a few shots of cinnamon whiskey. That would be delicious, and definitely a crowd pleaser! Step 1 – Assemble your materials. Step 2 – Put a dime-sized dot of glue on the back of the glass. 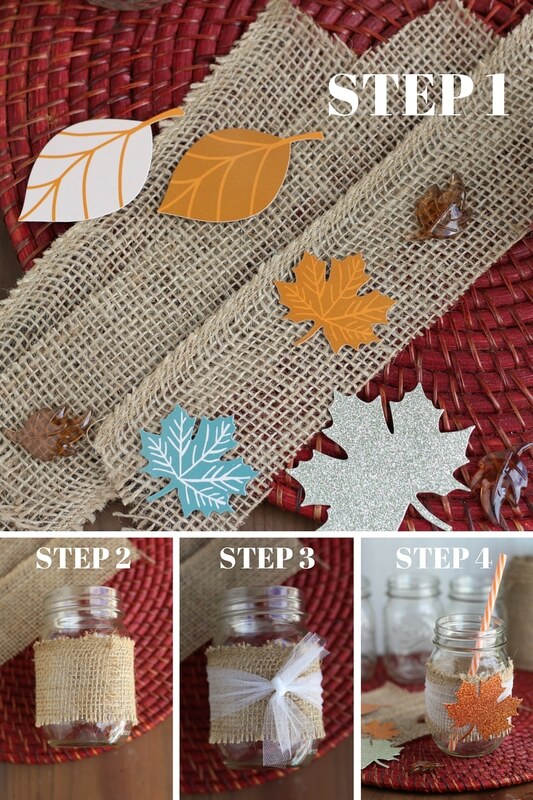 Wrap the burlap strip around the bottle, with the ends overlapping and meeting at the back. Press down with your fingers until the glue has set. Step 3 – Wrap the white tool ribbon around the jar, tie it in a knot. Cut off the excess. Put a drop of glue under the knot, press down until it’s dry. Step 4 – Turn the jar around. Pick your embellishment, put a dot of glue on the back of the leaf, choose your spot and hold it down for 30 seconds. Voila, you’re done! Pop a striped straw in that baby, and you’re good to go! Make sure you also decorate the front porch, entrance way, or front door to welcome your guests! You can see how I decorated my front porch here. Thank you for being part of my fall party, now go, and start planning yours! What are you waiting for?! What’s your favorite dish to serve at a party? Let me know in the comments!